Revisiting our successful collaboration with the NTU Singapore team last year, we approached them to see if this year’s team would be interested in partnering up again. After discussing our respective projects, a joint decision was made on how to best help each other. Knowing that we have expertise in protein purification and in vitro assays, NTU incorporated His-tags into the constructs that they wanted to test and requested for us to purify and test their dCas9 constructs in vitro. In return, knowing that the NTU team is experienced in quantitative PCR from our collaboration last year, our team was interested to know the different transcription levels of the genes within our functioning Hydrogen Gas Producing Gene Cluster plasmid this year (HGPGC) as it contains a few lac promoters within the gene cluster. We asked NTU Singapore to perform RT-qPCR after induction using IPTG to study the expression of our proteins in the gene cluster. Our instructor delivered our HGPGC plasmid to perform RT-qPCR to the NTU team during his holiday in Singapore, and brought back the plasmids containing the clones that they were interested for us to test on his return trip. The in vitro assay was performed on four truncated dCas9 mutants: wild type dCas9 (WT), 3P, 5P and HNH. This project used the dCas9 enzyme to form a Ribonucleoprotein (RNP) complex with gRNA, and subsequently bind to the target sequence in our PCR product (similar to what we did last year). 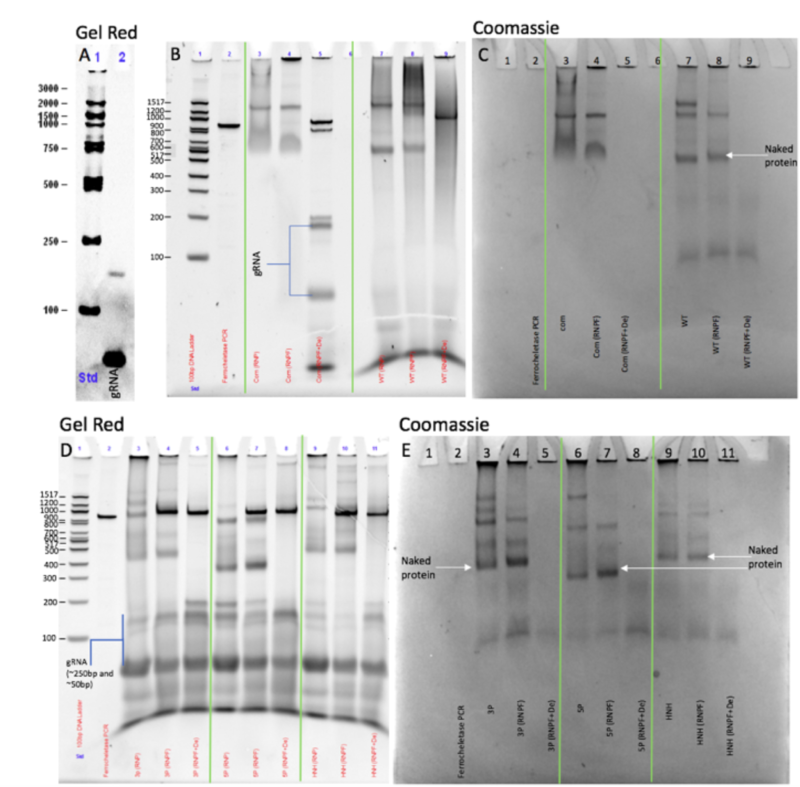 The results from the electrophoretic mobility shift assay (EMSA) show that the dCas9 mutants (WT,3P, 5P and HNH) were successfully truncated (Figure 1), and no longer retain their nuclease activity (see Figures 2,3). This is evident from the gel shift present, the shift of the target sequence protein and the presence of gRNA, indicating the mutant dCas9 has bound the target sequence of DNA from its slower migration through the gel (see Figure 2). Through their RT-PCR expertise, NTU Singapore aided us in gaining a better understanding of the transcription rates within our composite Hydrogen Gas Producing Gene Cluster plasmid. Our efforts have successfully purified their dCas9 mutants and suggest that all are functional in vitro. This has provided in vitro evidence for the NTU Singapore team that these four mutants are no longer functional nucleases, but retained their ability to bind the gRNA and targeted gene sequence. The plasmids were transformed into BL21 (DE3) E. coli and expressed under auto-induction conditions. Cells were then harvested, lysed and purified using a Ni-NTA resin with standard His-tag purification protocols. Eluates were then ran on an SDS-PAGE gel (Figure 1). The largest band in each of the eluates corresponds to the various dCas9 mutants with its respective truncations based on NTU’s design, suggested that the expression and purification procedure was performing well. Figure 1. SDS-PAGE gel of the His-tagged dCas9 constructs. Lane 1 contains a 198kDa ladder. The cell lysates and the corresponding eluates were loaded next to each other. Intact dCas9 proteins can be identified as the slowest migrating protein band in all the 4 constructs as the band with the highest intensity, showing a successful expression and purification of the His-tagged proteins. The 2 other bands could be observed in each of the eluate (and also observed in the previous year in Cas9 mutants) were suggested to be cleavage products during the protein synthesis. To test the dCas9 constructs, we adapted our in vitro CRISPR assay from the previous year to include in electrophoretic migration shift assay. 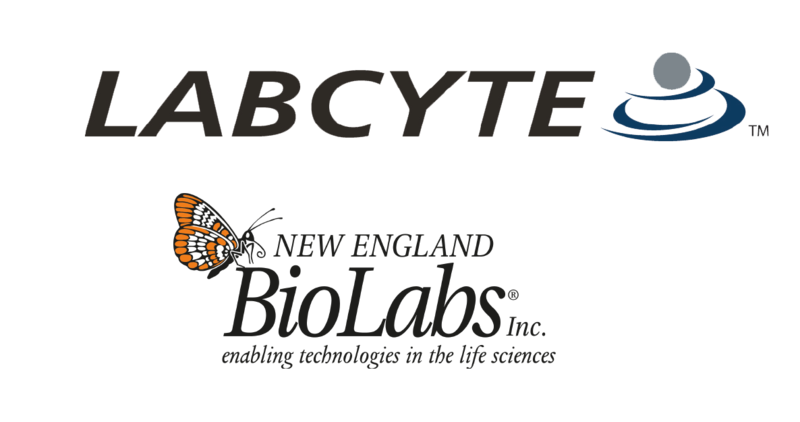 As the dCas9 constructs were designed to not have nuclease activity, while retaining the ability to bind to the gRNA and target DNA, we set up variations of the in vitro CRISPR assay to track the progression of the target DNA, gRNA, cleavage products, and protein migration on a DNA retardation gel (6% acrylamide in TBE, ThermoFisher Scientific), while comparing to a commercial Cas9 with nuclease activity. Deactivated: gRNA + enzyme + PCR product (further incubated for 1 hour at 37°C) and a deactivation step of 20 minutes at 80°C. Our experiment used a commercial Cas9 with nuclease activity as a control (see Figure 2). From this sample we have been able to better interpret our results. The pre-incubated control shows an upward gel shift of the gRNA (Figure 2A), indicating commercial Cas9 binding to gRNA (Figure 2B, lane 2). 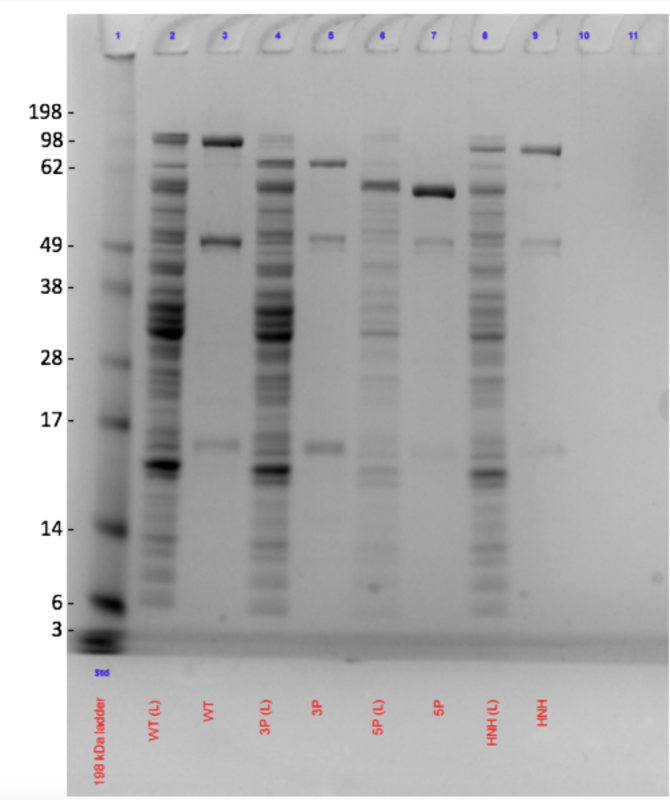 Upon incubation with the PCR product, there is a disappearance of both higher bands and loss of smearing, suggesting the formation of a stable conformation of gRNA, Cas9 and the target PCR product. The deactivation step causes the disassembly of the gRNA/Cas9 complex, resulting in the reverting of the gel shift of the PCR product and the gRNA, and also shows specific cleavage of the PCR product. Absence of the protein bands after deactivation is likely due to denaturation of the enzyme that results in protein aggregation/precipitation. From our results we observed the different truncated protein sites in the four samples: WT (dCas9), 3P, 5P and HNH (see Figure 1). The EMSA performed suggests binding to gRNA of mutant dCas9 in WT, 3P, 5P and HNH samples. This is evident from the observation of gRNA complexes shifting upon incubation with DNA. Protein shifts after incubation with the PCR product suggested that the mutants retained the ability to bind the target DNA. Deactivation of the protein DNA complex reversed the migration shift of the PCR product, providing further evidence that the dCas9 binds to the PCR product, while not having nuclease activity. Figure 2. Retardation gel (6%) electrophoresis. A, B and D are visualized under UV, C and E are coomassie stained. B and C, D and E are the same gels under the two visualisations. Note (A, B and D): shadows are caused by UV absorbance of proteins. A) Lane 2 contains gRNA (trRNA and crRNA) corresponding to two bands at ~150bp and 50bp. Lane 2 (B and C) contains target PCR product (~950bp). B) Lanes 3-5 contain commercial Cas9 (with nuclease activity). The gel shifts indicate the binding of gRNA to commercial Cas9 (lane 3), specific binding of Cas9/gRNA complex to PCR product (lane 4) and nuclease activity of Cas9 causing cleavage of the PCR product (~800 and ~200bp lane 5). Lane 7 contains WT pre-incubated gRNA, the gRNA gel shift, similar to lane 3, suggests binding of gRNA to protein. Lane 8 contains WT incubated with gRNA and PCR product, a protein shift suggests specific dCas9 binding. Lane 9 contains denatured WT and no gRNA complex can be observed suggesting strong binding of dCas9 to protein and no cleavage of the PCR product. D) and E) The coomassie stain (E) displays the band weights of the purified truncated proteins (highest intensity). The smears in pre-incubated samples (lanes 3, 6 and 9) indicate gRNA binding to protein. The disappearance of higher protein bands in incubated enzyme and PCR samples (lanes 4, 7 and 10) suggests dCas9 binding the target sequence. The high intensity bands of ~1000bp show excess PCR product not being bound by dCas9 and in denatured samples (lanes 5, 8 and 11) no cleavage of the PCR product is observed. All samples contain faint lower bands indicative of gRNA, suggesting binding is not as strong as in WT but still occurring. 1. What institutional body enforces the laws regarding the use of GMMs? 2. Who regulates the use of GMMs on a case-by-case basis? 3. What legal requirements do I have to fulfil in order to be able to use GMMs in my business? 4. As an employer who exposes their workers to biological agents, what safety measures am I obliged to adopt? 5. As a consumer, how do I know if a product I want to buy contains GMMs? 6. What are the most important documents related to GMMs? This document can be viewed on the Manchester iGEM team’s page. We used this document to assist in the formulation of our business plan (particularly our distribution strategy) and our safety protocols. With help from Mr Michael Rampe and Mr Peter Reeves from Pedestal our team designed a 3D rendering of our prototype, H2GEM, which will soon be available on their website. With this rendering, our team was able to conceptualise our design in the physical space for its potential use in marketing H2GEM. 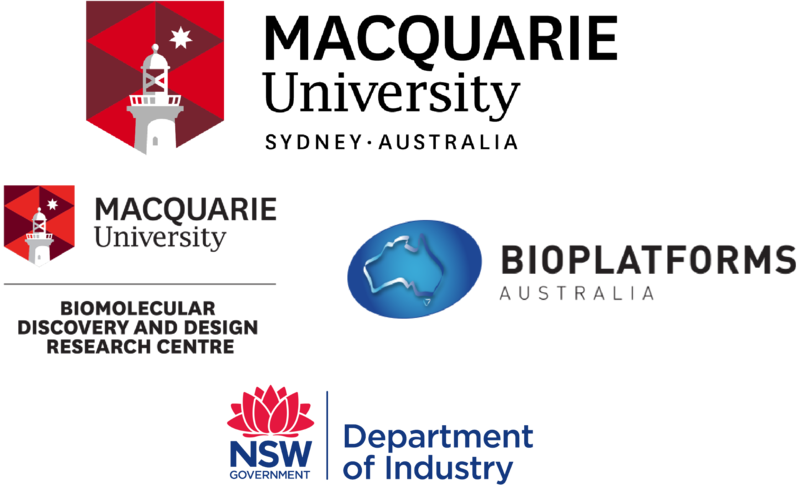 During the proceedings of the Synthetic Biology Australasia Conference, our team met up with our colleagues from Melbourne, Auckland and University of Sydney in Kirribilli, and presented our projects together during the iGEM session of the conference. The two days of the conference were capped off with social drinks and an impromptu trip to Luna Park, which was kindly organised by our iGEM Representative, Abigail Sison. “There has been an incident at the iGEM Giant Jamboree 2017 in Boston and numerous young scientists have been contaminated with some of the most dangerous viruses of our time!” Team Franconia developed an app that will run an augmented reality game, for which the Macquarie Australia iGEM team, H2ydroGEM, will contribute by attaching a small QR-code (approx. 4 by 4 centimeters/1.5 by 1.5 inches) on our station, for players to partake in the game, as well as attract our iGEM family to our station. H2ydroGEM is contributing to this game developed by the team from the University of Sydney, adding to the thrill of the iGEM spirit. The H2ydroGEM team helped the 2017 UNebraska-Lincoln team in providing an Australian perspective to the issue of methane production. Guided us in ensuring our team kept in line with various ethical concerns involved.